Das neue Fotobuch wird am Tag der offenen Türe 2018 zusammen mit einem Scheck über 2300€, welches am sozialen Tag von den Schülern erwirtschaftet wurde, überreicht. Der Vorsitzende des Ruandavereins Hachenburg, Thilo Leonhardt, nimmt das Buch und den Scheck in Empfang und wird das Buch Ende September selber unserer Partnerschule überreichen. Ebenfalls wird offiziell das neue Schild der Schulpartnerschaft eingeweiht. Erstellt wurde das neue Buch von der FOS, vor allem von der Klasse 12G. Vielen Dank für euer Engagement! Ebenfalls ein Dank an die Klasse von Frau Michel, die bei Frau Niemann im Englischunterricht viele Postkarten geschrieben haben. Die Klasse 12G des Abschlussjahrgangs 2014 erstellte als Abschlussprojekt dieses Buch. Es wird Ende Oktober durch Herrn Thilo Leonhardt vom Ruandaverein Hachenburg im Rahmen einer Delegationsreise an unsere Partnerschule (Sekundarschule Save, Distrikt Gisagara) übergeben. Vielen Dank für das Engagement, das Buch zu gestalten! Besonderer Dank geht an Ruth Fast, die diese Idee so toll umgesetzt hat! Im vergangenen Schuljahr nutzten die Schülerinnen und Schüler der Realschule plus und Fachoberschule Hachenburg wieder die Gelegenheit, an einem Tag für soziale Zwecke arbeiten zugehen. Das dabei verdiente Geld wurde zu je einem Drittel für das Kinderhospiz Bärenherz, die Partnerschule in Ruanda und in den Sozialfonds der Schule gespendet. Insgesamt kam die stolze Summe von 8532 € zustande. Am Tag der offenen Tür wurde dann die Spende von 2844€ an den Partnerverein Ruandahilfe Hachenburg, durch den Vorsitzenden Herrn Thilo Leonhardt und Frau Menkowski übergeben. Mit diesem Geld wird an der Partnerschule der RS+ und FOS Hachenburg, der Sekundarschule Save in Ruanda, ein Ernährungsprojekt, um die Schüler einmal am Tag mit einer warmen Mahlzeit zu versorgen, unterstützt. Zu diesem Zweck werden Saatgut und Materialien gekauft. This is the monthly update on our activities. 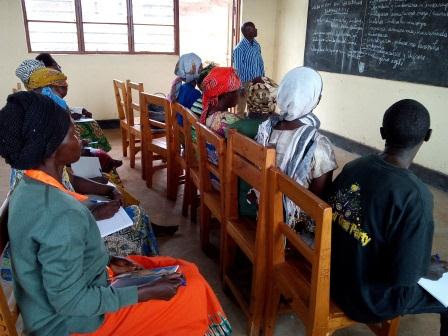 The school department has implemented a number of small agricultural projects at different schools which are affected by a new policy of the Rwandan Ministry of Education (MINDECU). So far, boarding schools where the only places where students could graduate with an A levels after 12 years of education. Therefore, everyone wanting to achieve a good education level needed to be able to finance the high school fees of boarding schools. According to the new policy, students who do not have the financial means to do that now receive the chance to stay with their families and continue their studies within a changed system of day schools. These students can graduate from school at regular secondary schools after a period of 12 years. Thus, many changes take place; new schools have to be constructed and already existing ones must expand in order to provide enough space for all students. The idea behind the conducted policy is that everyone has good chances to graduate with A levels independently from the personal background. However, many of the students who now stay in secondary day schools to continue studying there come from poor families and cannot afford the school fees. Thus, these schools suffer from a lack of money and support. In addition, some students leave the school, because they do not have enough to eat, especially during lunch break, which also reduces their mental capacity as well as their performance. For this reason, partners from Rhineland-Palatinate started to finance so called “school feeding” projects. With the support of the German partner “Ruandahilfe Hachenburg e.V.” such a project was implemented at the secondary school in Save in the Southern Province. Arable crops such as beans, corn, vegetables (e.g. cabbage, carrots and onions) and fruits like pineapples and bananas were planted. At the beginning, around 100 students did not attend the lessons on regular basis, most of them were women. Meanwhile, there are 1146 students visiting the school and no one among them is known for dropping out of school. That “school feeding” project in Save was implemented by the school department of the Coordination Office in collaboration with the headmaster, one teacher representative as well as the parents and students. 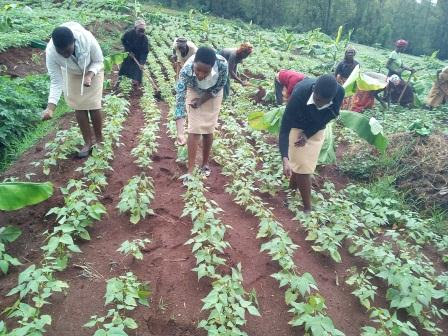 The project is managed by a team of parents of the benefitting students who received training in modern agricultural technics. These parents showed others how to treat the plants. Students join the work on the field for thirty minutes each so that they do not miss too much lessons. 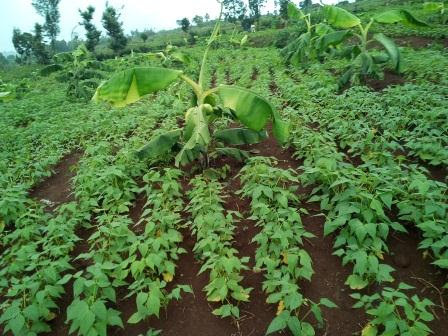 In March 2017, a new phase was started as beans were planted between the already growing but yet small banana plants. The parents are well organized and manage not to neglect their daily activities while having work on the field to do. We hope to have a great harvest as soon as the rain season comes to an end. As you can see on the pictures below, the plants are growing quickly. Other schools with some space try as well to plant crops in their gardens or, if they possess, on their fields. Moreover, some schools also started animal rearing projects. In general, “school feeding” became an important activity of our partnership, especially since the changes within the school system have been conducted. At the day schools which now offer a twelve-year-long education there often are many students who do not have enough to eat. For the sustainability it is important that the parents take care of the agricultural work themselves and independently. Following this path, more students will be able to perform well at school and less of them will drop out. We are looking forward to implemented similar projects in the future and are thankful for the financial support by the partners in Rhineland-Palatine who will help us realizing that.